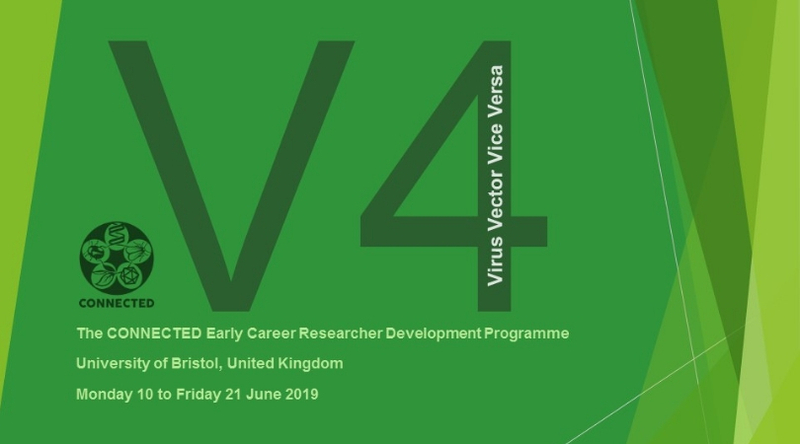 Applications are now open for V4: The CONNECTED Development Programme for Early Career Researchers – a fully-funded ten-day residential course at the University of Bristol, UK (10 – 21 June 2019). The purpose is to create a cohort of Early Career Researchers (ECRs) with a joint understanding of virology and entomology which enables them to collaborate effectively on the research challenges of plant vector-borne diseases in Africa. scientific talks general lab training skills specific virology and entomology lecture and practical work workshops desk-based projects, and soft skills training. new scientific knowledge practical and technical experience knowledge for cross-disciplinary working knowledge and experience of writing collaborative funding applications to tackle important plant VBD problems, and a new network of fellow ECRs. Participants will be able to make use of these new skills in their home place of work, building capacity, for example in managing existing projects, developing new projects and techniques, and applying for research funding. V4 will run from Monday 10 – Friday 21 June 2019 inclusive, at The School of Biological Sciences, University of Bristol, UK. Applicants are kindly asked to read the guidance notes in full before completing the application form. Click here to apply. For more information, visit CONNECTED. a new network of fellow ECRs. Funding is available to cover travel, accommodation, subsistence and all training costs of successful applicants. Anyone who is not currently a network member can join free of charge here. Applicants are kindly asked to read the guidance notes in full before completing the application form. For more information, visit CONNECTED.